The stylish Toy Organizer can be a useful addition to your child's room as it helps to conveniently store playthings. It features 12 bins including 8 regular-size and 4 double-size bins to provide plenty of storage space. They can be arranged on the wooden shelf for easy access. These white bins blend well with the espresso wooden toy organizer to create a unique look and accentuate your room decor. Made from heavy-duty wood, this item offers solid support and long-lasting durability. The kids' toy organizer has a space-saving design that is ideal to use in a bedroom, playroom or nursery. This item is easy to assemble, and the sturdy plastic bins can be used to store a variety of items. 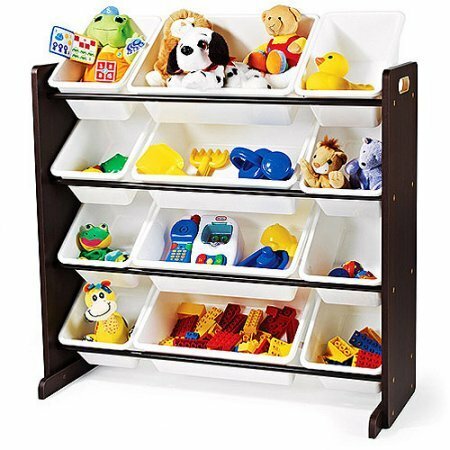 Measures: 11"D x 34"W x 31"H.
Wooden toy organizer provides easy access to contents. Beautiful design to enhance the decor of your room.